Kate Clancy is an Assistant Professor of Anthropology at the University of Illinois at Urbana-Champaign who studies evolutionary medicine, and the intersection of endometrial functioning, stress and inflammation. She is currently running focus groups to learn about the experience of obtaining hormonal contraceptives from doctors; women in the U.S. use hormonal contraceptives much more than any other country in the world, and Clancy would like to better understand why. If you would like to get involved or want more information, contact labevoendo@gmail.com. Kate is a rising star among science bloggers — she blogs at Context and Variation and you can follow her on Twitter at @KateClancy. She has a daughter, two cats, and has been promised a dog. Kate Clancy with her daughter and husband. Photo provided. 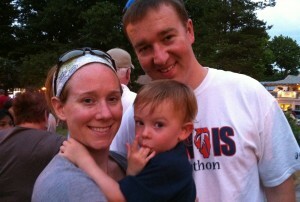 See why we think Kate Clancy is a Chambana mom to know. Q: You are passionate about women in science. How do we make sure our girls and our boys stay interested and engaged in the field? Parents and teachers need to model a zest for science, curiosity with nature, and an appreciation of logical testing of our questions about how the world works. There are iPhone apps and games online, but just setting your kids outside does a lot to help them connect with the world around them. If parents teach their kids that learning is an end in and of itself rather than a means to a degree or a means through which to get praise, I’ll get much more engaged college students in my classrooms and we’ll have a more scientifically literate public. Q: With everything you do – teaching, research, service, etc., why are you blogging? I blog because I love the academic and science community online, and because I want to put out better information on women’s health than what’s out there. I want more women to understand what hormonal contraceptives do. I want them to treat their bodies with more generosity and patience. I want my writing to come up when women Google questions about their menstrual cycle or IVF, because I think I have an anthropological perspective that is really useful. Women are eager for good information about their bodies, so I am trying to provide it. Finally, I write a blog because I want to talk about what it’s like to be a female scientist. In my 10 years of college and graduate school, I took only two anthro classes taught by women. Sometimes you need to search online for mentorship, so I hope I can provide that with my blog. Q: As the mom of a daughter, how concerned are you about early puberty trends these days? Early puberty happens for lots of reasons — genes, low physical activity, energy-dense diet, sometimes even for social reasons. We can help control some of these factors by keeping our kids active, and what we do to keep them healthy will make puberty happen later to some extent; this is good in terms of reducing reproductive cancer risks later in life. But sometimes a kid just develops early, and that’s OK too. Variation is to be expected in most US communities, because there is so much variation in lifestyle, immigration, ethnicity, and socioeconomic status. Q: What is your biggest challenge as a tenure-track junior faculty member when it comes to work/life balance? The biggest challenge is getting back to work after my daughter is in bed, or carving out time on the weekends. That has been a slow process, because she slept with us for the first two and a half years, then got her own bed but we’d lay with her until she went down, then just this week we tried putting her to bed on her own (and it worked, hooray!). Now I am less tired and have more time at night, so I can do low-energy tasks in the evening and use my regular work hours for more brain-intensive tasks, like writing grants. Q: I would be remiss if I didn’t ask you about Derby – what is it like to be a Derby girl? What’s your Derby name? As if I didn’t have enough to do! My derby name is Jane Goodbrawl and I’m with the Boneyard Bombshells. Roller derby is what pulls all of these things together — without a space to be strong and athletic and physical, I think my job, parenting and blogging would make me crazy. I don’t talk about work with these women, I just skate around with them and we play and goof off and race and fight and hit each other. Then we try to teach each other not to say sorry, then hit each other again. It’s one of the most marvelous things in the world. Q: what’s your ideal of a weekend morning with your family in Champaign-Urbana? We have a Saturday morning ritual: we get up and go to Courier Cafe, where all the servers know my daughter Joan, almost three years old, and greet her. Joan orders the kid pancake with bananas and syrup, and Priscilla, her favorite server and bestest friend, always makes a face with the banana slices for her. Then if it’s farmer’s market season we head over there for some produce, then to roller derby practice at Skateland. My husband and daughter play for a while to kill time while I do my skating and hitting thing, then they head to Little Gym for her tumbling class. I walk from Skateland to Little Gym, then we head home for lunch and naptime. We often fit a carwash somewhere in there too.